Large - 26" x 38"
In this hectic life, when you have several other works to do, you can’t just invest your quality time in regularly washing your pet’s bed. Better is to protect them with dog bed cases. Dog bed cases are best way to shield your loving dog’s bed with all sort of dust, mud and uninvited guest i.e. Dust mites. Dog bed cases boast huge advantages and are considered to be one of the smart investments as it worth every penny. Sleeping on a bed case should be a soothing experience for your dog and for this, ensure the quality and kind of fabric used in it. Dog bed cases are usually made up of lavish poly cotton fabric with zip at one end that fully encloses your dear dog beds. 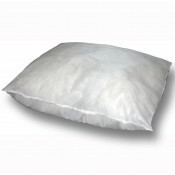 The poly cotton is a high quality fibre and gives immense relief and warmth to give your pet. Check that the bed case that you purchase should be smooth, fluffy and silky. Your furry friend will surely have a soothing and serene sleep with quality dog bed cases. The luxurious dog bed cases protects your loving dog’s bed from microscopic dust, dirt and microbes. Apart from protection, it bestows an additional layer of warmth and comfort to your dog’s bed. Your dog will have homily experience with luxurious bed cases. They are wonderful in proving an extra support to ageing dogs who frequently suffer with strains and joint pains. Today, wide ranges of dog bed cases are accessible in the market with array of colours and patterns to compliment any decor. These dog bed cases not only look stylish and magnificent in sprucing up your bedroom but are best for your pets too. But before you purchase these bed cases, do consider its fabric and maintenance. Ensure that the bed cases that you buy should be highly durable, waterproof and machine washable. Waterproof bed cases are excellent for those having small puppy and ageing dogs. They tremendously enhance the life of your dog’s bed due to their water resistant property. Dog bed cases are very handy and can be washed in machines too. It’s much convenient and less tiring to just wash the bed cases or changing them frequently rather than washing the whole bed or buying the new one every time. Moreover, frequent washing of your pet’s bed will also clump the inside soft filling of it.